Objects from the Enchantment of Textiles. Textile antennas laid onto each object will wirelessly connect them each other, to viewers and to random electromagnetic fields in space: boots, wall sampler, mirror, magic wand + other objects in progress. Maxwell’s Equations is a collaboration between Barbara Layne, Studio subTela and Lauren Osmond, with Geneviève Moisan, Tahseen Mustafa, Ahmed Kishk, Donna Legault, Hesam Khoshneviss, Sareh Majidi, RythÂ Kesselring, Claire Nadon, and Marc Beaulieu. Maxwell’s Equations consists of three garments that incorporate unique antenna designs that wirelessly connect the garments to one another. The designs draw inspiration from 19th century fashion and from James Maxwell’s pioneering theories of electromagnetic fields. When physically aligned, the strength of the connection will change the texts and formulas scrolling through the LED panels. The antennas on the front of the dresses are in the shape of one of Maxwell’s diagrams. Photo credit First Image: Matthew Brooks; Black and White Image is Nina Bouchard: all others do not require photo credit. The Branko Belt Project is a suite of 3 receiver dresses and one transmitter coat. Each garment has an antenna embroidered on the front. When oriented toward one another, the LED Display changes messages, depending on the signal strength. 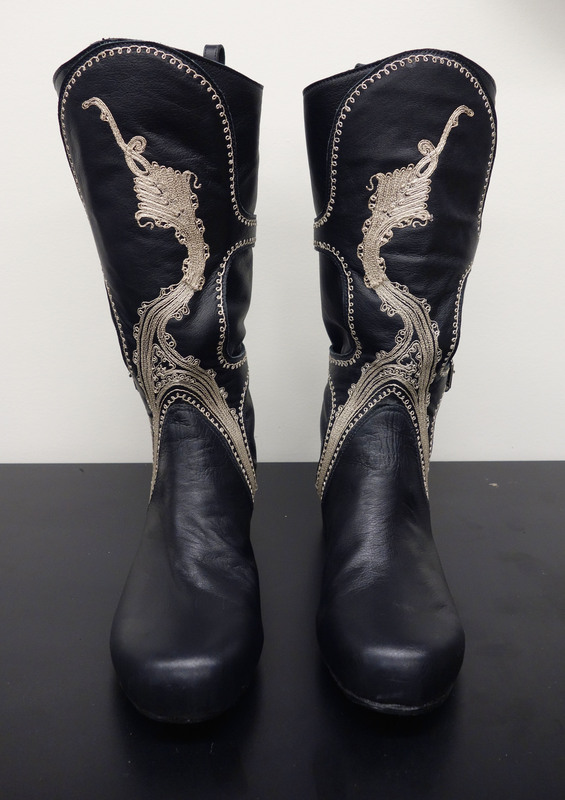 The project is based on a medieval belt from the British Museum. Antennas and scrolling narratives refer to the images on the original belt (a bear, a falcon, a wyvern and a panther). The project was created with Janis Jefferies and Studio subTela. 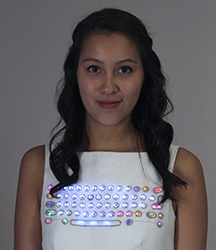 The embroidered “keyboard” of this dress acts as a display. 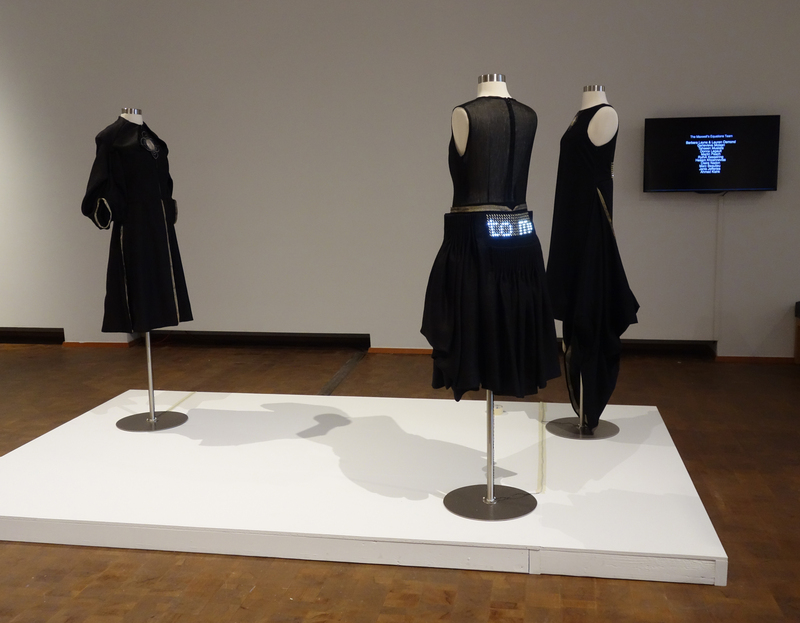 When typing on a digital tablet that is connected wirelessly to the dress, the letters of the keyboard become illuminated. The back of the dress is connected with two silver ribbons. When clipped together, the dress is switched on and when unconnected, the dress is turned off. The dress is made of white linen with embroidered silk organza. LEDs have been stitched on the linen base using an Arduino platform and XBee wireless system. Drawings made on the touchpad’s silver conductive grid will activate the corresponding LEDs that have been handwoven into the cloth. 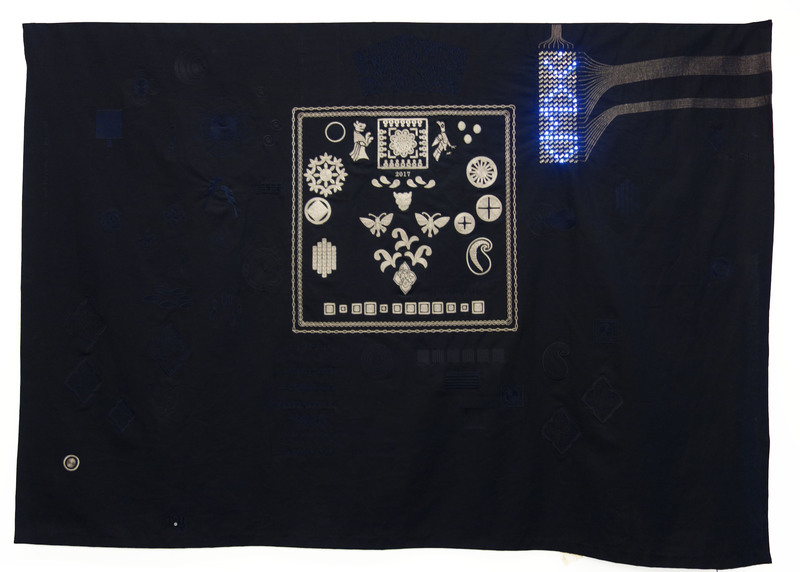 The hand embroidered touch pad on this dress will activate the LEDs in the displays of the Currente Calamo Project (below). 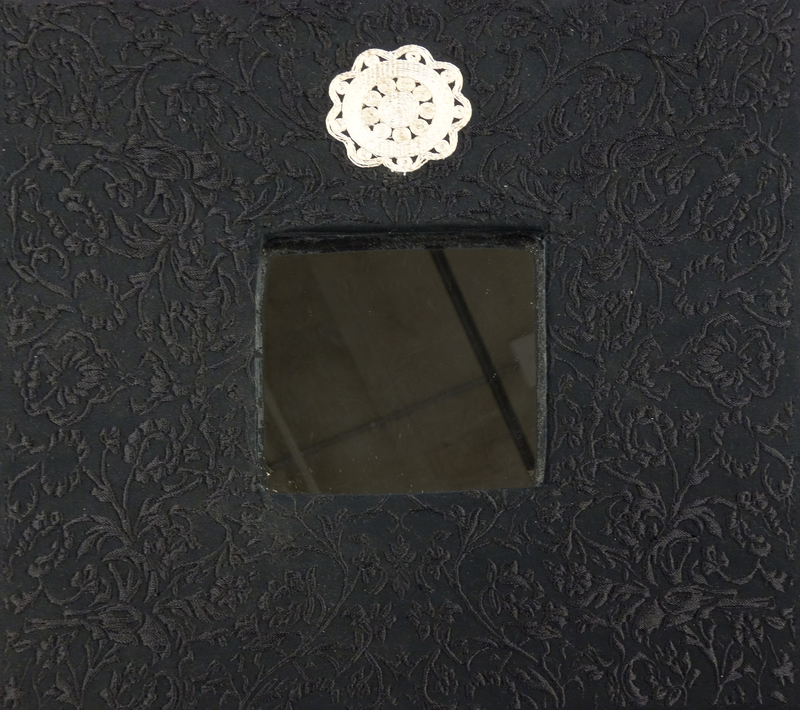 Drawing on the hand embroidered touchpad will activate the LEDS on the dress in real time. To “erase” the image, simply press the palm of the hand to the touchpad. 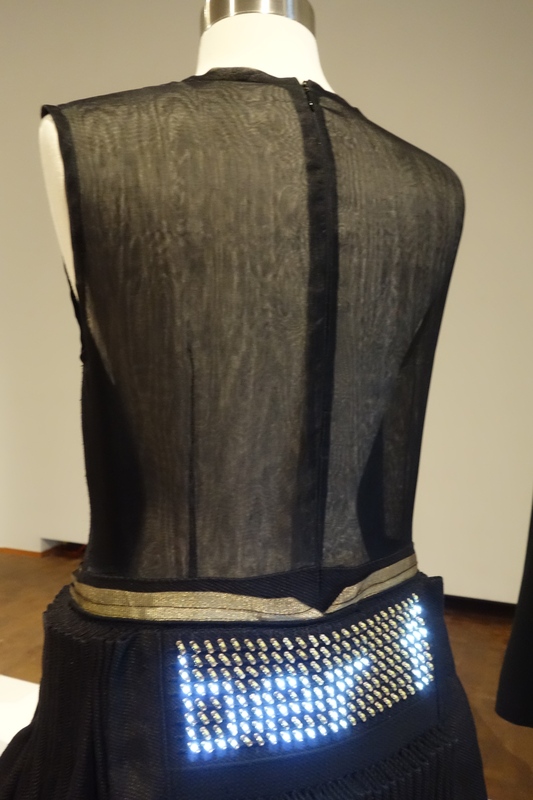 The hand embroidered touchpad on this dress can activate the LED display in this image, or the LED dress (above). This animations on this dress can be changed using a specially designed software. The new animation is sent wirelessly to the dress. The LEDs have been handwoven into the fabric as it was being made.